Once upon a time, there were five boys from Osceola, Wisconsin named Stickley - Gustav, Albert, Charles, Leopold, and John George. They were all interested in furniture-making - and when they grew up, they did just that. Sometimes they worked together, sometimes they competed with one another. In early 20th-century America, there were also four different companies bearing the name of Stickley. Here's a breakdown of each of them, with their sample wares - illustrating the evolution of furniture styles, especially within the Arts and Crafts movement. The oldest of the Stickley brothers is decidedly the most famous. Gustav Stickley - a furniture designer, architect and publisher - preached that furniture should be rational. This is, well-made, comfortable, and practical. As such, he was a foremost proponent of the Arts and Crafts movement in the United States. Founded in 1898, his company (which after several names, became known as Craftsman Workshops) fully embraced the Arts and Crafts style in 1900. The name of his business coincided with terminology he coined, as he dubbed this style of furniture "Craftsman." Many times, though, it is referenced as "Mission" or "Mission Oak," and the terms can be used synonymously. Based in Eastwood, New York (a suburb of Syracuse), Craftsman Workshops was in business until 1916 when his younger brothers bought him out. After Gustav Stickley's company, the firm of the two youngest Stickley brothers, Leopold and John George, is the best-known. Based in Fayetteville, New York, it opened in 1902. L. & J.G. Stickley's designs followed the styles set down by Gustav, but were sometimes more conventional, less rigidly devoted to the rectilinear and austere. For example, the sideboard above features a more rounded, flowing curve at the base, compared to the crisp edges of Gustav's desk in the first slide of this feature. In 1916, they actually bought out Gustav and the combined company was briefly known as Stickley Associated Cabinetmakers, and then the Stickley Manufacturing Company. The younger Stickleys continued operations until 1974, though it had stopped making furniture in the Arts & Crafts mode by 1923. In 1891, Albert Stickley opened a company in Grand Rapids, Michigan. This was the center of the American furniture-making industry at that time. The firm was dubbed "Stickley Brothers" because he was accompanied by his youngest brother John George, who eventually moved back east to team up with Leopold to form L. & J.G. Stickley. Albert kept the "Brothers" in the name after John George left, but gradually began shifting his designs toward British-influenced Arts and Crafts furniture. 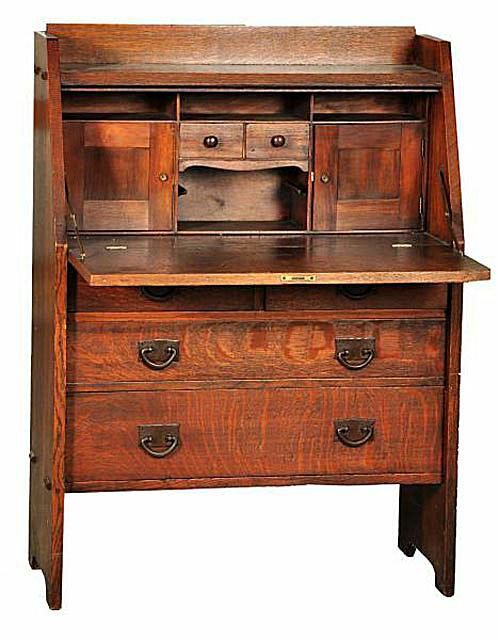 He marketed these styles as "Quaint," as the pieces were somewhat more decorative than those true to Arts and Crafts teachings so closely followed by Gustav Stickley. Albert kept his company alive until 1947. Charles Stickley and his cousin, Schuyler Brandt, formed the Stickley & Brandt Chair Company in 1891 in Binghamton, New York. They quickly became the largest furniture dealer in the state of New York. At first, before the Arts and Crafts movement took hold, they specialized in ornately carved chairs and settees that were a literal mash-up of popular Victorian styles. The chair shown here is typical of this period in the company's history. Continue to the next slide to see one of their chairs with more Arts and Crafts influence. In 1909, Stickley & Brandt began making Arts and Crafts pieces like those designed by Gustav as well the other Stickley brothers during the period. They continued making this type of furniture until the company went out of business in 1918. So, for the most part, while the Stickley brothers were known to do their own thing independently of one another, their work is intermingled as well. All of them worked extensively in the Arts & Crafts style, although pieces made by Gustav's Craftsman Workshops are still more highly regarded (and valued) in collecting circles than the work of the other brothers even when they were remaking his designs or producing their own designs inspired by him. Gustav Stickley and L. & J.G. Stickley: Do You Know the Difference?